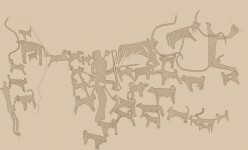 The dogs illustrated in the Neolithic hunting scenes at Jubbah and Shuwaymis appear to be medium-sized, with erect ears and a curly tail. They do not have a slender build or long legs like a saluki or other sighthounds, but rather have average length legs and a strong, but not massive body. 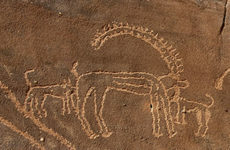 In at least two scenes, markings representing coat patterns show that the pelage was a different color on the throat and chest. This combination of traits closely matches with a pariah dog known as the Canaan or Bedouin Dog, which has a medium, strong build, moderately broad and deep chest, well-tucked up loin, pricked ears, moderately high tail carriage and a tail that curls over the back when alert. A light throat and chest or shoulder markings are not uncommon. In addition, this type has a short to medium length pelt with straight guard hairs, no feathering on the legs or tail, but with a thick winter coat. The modern breed has two color patterns: white with a mask, with or without additional patches of color, or solid colored with or without white trim. Acceptable colors in the breed include white, sandy to reddish brown, black or harlequin. 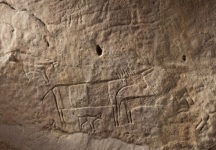 Historically, the Canaan dog was a feral animal, but the Bedouin captured young male individuals and tamed them rather than breeding the dogs in captivity. 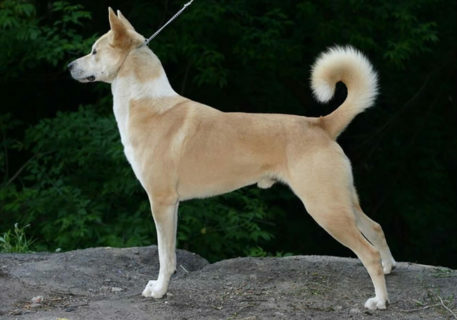 Today the Canaan dog is a registered breed and has mostly been eliminated in the wild. They are known for being independent, but not aggressive, and they make excellent guard dogs for the camp. Many show natural herding instincts, so they are also used to guard the livestock. In the wild they survived by hunting and scavenging for their food. Canaan dogs are capable of surviving in very arid environments. 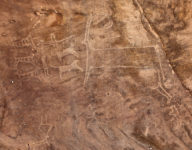 In historic times, they were feral in the Sinai, Negev, and Arabian deserts. 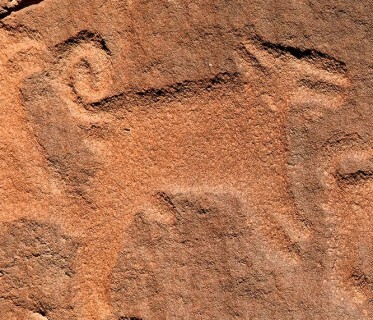 Today, most have disappeared in the wild, but as a breed are more widespread. 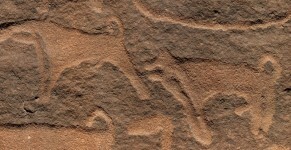 Uqulqh is a large sandstone outcrop not far from the ancient city of Tayma. 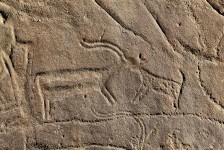 It features Arabian horses with tasseled tails that resemble those of donkeys or camels.